A friend posed this question today in a slightly different way - "Can a single [Python] command determine the largest of some integers AND that they aren't equal?". While we didn't find a way to do this within reasonable definitions of "a single command", I thought it might be a fun problem to golf. "Return the largest of a list of integers if-and-only-if they are not all equal." Entries may be a full program or just a function, provided you provide some way to test them! For the avoidance of doubt, the explanation of the challenge given just after "More specifically" shall supersede the statement of the challenge above it ("Return the largest..."). This is code-golf, so the code with the shortest number of bytes wins! -33 bytes thanks to digEmAll! -13 bytes thanks to rturnbull! This works because both the max operator and the discard from left operator don't do anything for empty lists. Well, the max operator removes the list and pushes nothing for empty lists. It could be 4 bytes if input could be taken as a list. Returns an empty slip if everything is equal. outputs to stderr (debug on tio). ('[':). (++"]") takes a string (e.g. "1,2,1,3") and encloses it in bracket chars ("[1,2,1,3]"). 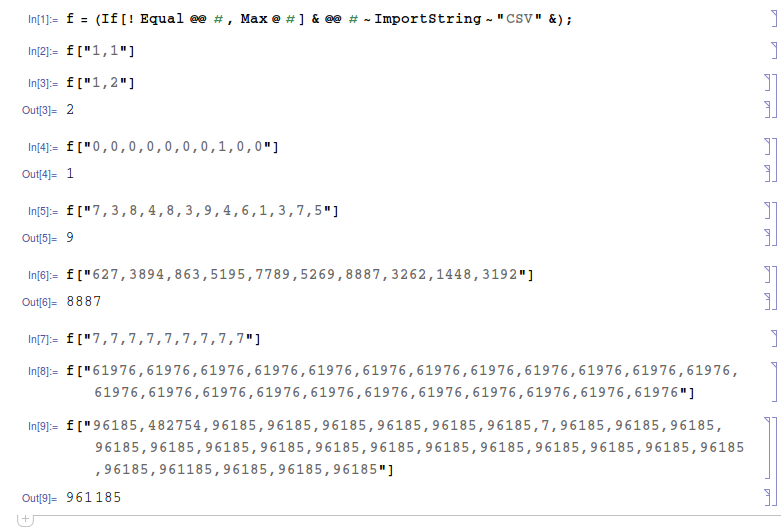 Then read turns the string into a list of integers ([1,2,1,3]). The function f uses this tip for a shorter conditional if one of the outcomes is the empty list. any(/=a! !0+0)a checks whether the list a contains any element that is not equal to its first element a!!0. (The +0 is needed such that read knows it has to look for a list of numbers.) If all elements are equal this test results in False and the empty string is returned. Otherwise show(maximum a), that is the maximum of the list converted to a string, is returned. Full program. Prompts for string from stdin. Returns the maximum (a number, which is an 1x1 matrix) or an empty (1x0) matrix. This would be 9 if not for the unnecessarily strict input format, 7 if throwing an error counts as outputting nothing. Assumes the string contains at least 2 integers. Could be reduced by one character if you allow the context to bind a shorter prefix than "xs" to the XML Schema namespace. Explanation: takes the input string, tokenizes on "," separator, applies xs:int() to each token to convert to an integer, computes the max of the sequence, outputs the max provided the predicate $t!=$t is true. If A and B are sequences, then A!=B is true iff there is a pair of items (a from A, b from B) such that a!=b. NOTE: this doesn't satisfy the requirement "represented as it is in the input" - if there's an integer with leading zeroes or a plus sign in the input, these will be lost. I suspect that's true of many other solutions as well. If you're wondering why certain operations are performed before others, K4 does not have operator precedence, it instead interprets from right to left (though you can use parentheses for precedence). Expressions seperated by semicolons. Can probably be golfed down more, not a fan of having to use that makeshift max function at the end. Taking the total to 40 37, but the comma before the number simply means that it's a single element list as opposed to an atom. split was removed in PHP7, but as I had to add 10 to fix a few issues, it was worth using instead of explode which is roughly equivalent in this case. -3 bytes if the input could be taken as an array. ',¡        '# Split the (implicit) input by ","
õ    #  Push an empty string ""
Split the input on commas and cast each value to integer. Test whether the maximum value is greater than the minimum value. If so then cast the maximum value to string and print. o<0?m-=o:0) // End of loop: if difference <0, deduct from max, increasing it to new max. l|=o=m-atol(++s); // Read next number, and subtract it from current max. s=l?m:-1; // End of function: if l is non-zero, there were at least two different values. // Return -1 if l is zero, otherwise the max value. As Pyth is based on Python, user input is always interpreted as a string, which then may be passed through eval(). All Pyth programs automatically run Q=eval(input()) as their first instruction. Just trying to keep my MATL chops from getting too rusty! Edit: rusty after all; saved 6 bytes, thanks to @LuisMendo. &=? % Are all the values equal? X>    % And find its maximum value. The first 5 bytes a^:', split the input string on commas.